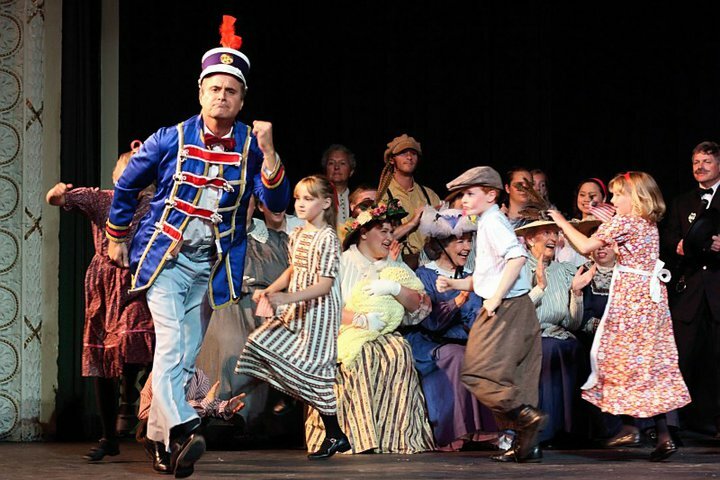 This weekend I went to see the Cedar Falls Community Theatre production of The Music Man. I had watched the movie before but had never seen the play. It was an overall great experience. The story takes place in fictitious River City, Iowa which was inspired by Mason City, Iowa where the author of The Music Man, Meredith Willson, was raised. The Music Man first opened on Broadway in 1957 and won five Tony Awards and went on to be performed 1,375 times on its first Broadway run. (There have been two revivals of the play on Broadway, 1980 & 2000.) The film premiered in Mason City and today if you go there you can tour Willson’s boyhood home and visit The Music Man Square museum which celebrates Mason City’s musical tradition. Willson was actually nominated for two Oscar awards in his career, though neither were for his work on The Music Man, but rather for The Little Foxes (Best Music, Scoring of a Dramatic Picture) and the classic Chaplin film, The Great Dictator (Best Music, Original Score.) In 1958, the music from The Music Man beat out West Side Story to win a Grammy Award (Best Original Cast Album). The original play The Music Man starred Robert Preston as con man Professor Harold Hill. He won a Tony Award for Best Actor in a Musical and also starred in the 1962 movie. The local production here starred Gary Kroeger who was a writer/performer on Saturday Night Live between 1982-1985. I agree with the people who saw the play and know Kroeger (who lives here now)— it was a role made for him. Some people even remember when he had the lead in the same play back when he went to high school here. His co-star in the play is Kristin Teig Torres, who can be seen on the demo reel at RiverRun.tv from a project we shot a couple years ago. And while I’ve been to plays in large theaters in New York, Chicago, and Los Angeles there is something special to walking eight blocks from your home to downtown Cedar Falls to have dinner, and then watch a play in a restored 100 year old theatre. It’s nice to sit close enough to see the faces of actors you know who are performing words and songs written by someone who was raised an hour and a half away, knowing that that play has been performed and entertained people all over the world for more than 50 years. So before the Field of Dreams, The Bridges of Madison Country, and Sleeping with the Enemy there was The Music Man to pave the way for future stories set in the quintessential heartland. By the way, Nancy Price, who wrote the novel Sleeping with the Enemy, was at the performance Friday night which added a little extra reminder that every once in a while something other than corn comes out of the state of Iowa. So wherever you live check out the community theater in your area. There’s magic and talent in community theaters all over this country. (I hear even Charlie Sheen is getting into the community theatre spirit by volunteering his time to work with a quaint small town in Colorado.) I think as films become less and less expensive to make you will not only see a growing regional film movement, but one that is the equivalent of community theater. Keep in mind that our local community theater raised $1.2 million to renovate a historic theater a few years ago, so there are people and businesses ready and willing to invest in the local arts community. Oh, and speaking of The Music Man, remember a little kid named Ronny who played Winthrop Paroo in the 1962 movie? Hard to forget him singing, “O the wells Fargo wagon is a’comin’ down the road, O please let be for me.” He went on to act in a few more productions such as The Andy Griffith Show, American Graffiti and Happy Days. These days that young Oklahoma-born actor is more well-known as the director Ron Howard. On Saturday in Chicago he’ll be honored for a Career Achievement Award at the Chicago International Film Festival. And what a career it’s been—Apollo 13, Cocoon, Parenthood, Splash, Frost/Nixon (Oscar Nomination), and two-Oscars wins for A Beautiful Mind (Best Director, Best Picture).